Law Web: Whether person concealing material facts can seek assistance of Court? Whether person concealing material facts can seek assistance of Court? The present petition has been filed by the petitioners for alleged bona fide requirement of Petitioner 1 only. The discussion above, makes crystal clear that Petitioner 1 has concealed the material fact that his son named Atul owns a flat at Pooja Apartments, Patparganj, New Delhi in pleadings. Petitioner 1 has also sought eviction of the respondent tenant for residential requirements of his said son Atul and his family members. In my considered opinion, Petitioner 1 is guilty of concealment of residential accommodation owned by his son at Pooja Apartments, Patparganj, Delhi. 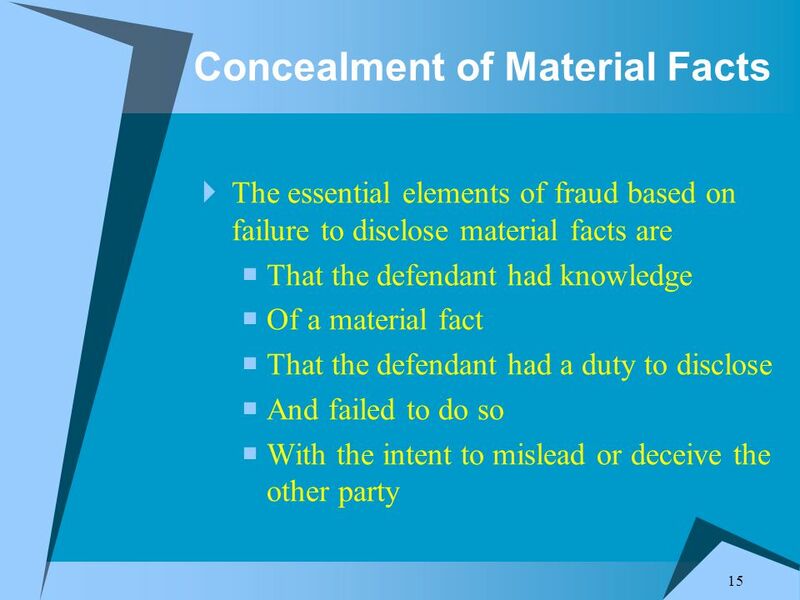 It is well-settled law that a person concealing the material fact cannot seek the assistance of the Court. Kishan Chand Vs. Jagdish Pershad and Ors. U.C. Banerjee and K.G. Balakrishnan, JJ. 2. This appeal is directed against an order of rejection of the civil revision petition by the High Court of Delhi, wherein the High Court categorically came to the conclusion that the appellant is guilty of concealment of material facts. 3. Incidentally, the appellant sought eviction of the respondent tenant on the ground that he required the tenanted premises bona fide for his residence and for the residence of his son. The High Court proceeded on the basis that there was in fact a flat allotted to the appellant's son which has already been taken possession of by the son and since there is no mention of the availability of such a flat in the body of the pleadings, the petition ought to be rejected by reason of concealment of material facts and hence the appeal before this Court. 4. The learned advocate appearing in support of the appeal very strongly contended that there has been some confusion and mistake of facts which has prompted the High Court to come to a finding of concealment of facts. Strong reliance was placed on a decision of this Court in Kishan Chand v. Chiman Lal MANU/SC/1526/2001 : (2003)9SCC153 wherein this Court on an identical state of facts set aside the impugned order and the revision petition was remanded back to the High Court for fresh disposal on merits in accordance with law. 5. The learned advocate appearing for the appellant contended that the order of this Court in Kishan Chand case covers on all fours the facts herein and as such a three-Judge Bench judgment ought to have precedence in the matter. (iii) PW 1 in his cross-examination deposed that there are 13 rooms in Property No. 2516-17, Churiwalan, Delhi and he has no documents to show that other petitioners are living in this property. The case of the respondent from the very beginning has been that the said entire building is in possession of Petitioner 1. RW 1 Jagdish Pershad has deposed that the said Property No. 2516-17 is owned by Petitioner 1 and there are 35 rooms in all in this property and Petitioner 1 is in possession of all the said 35 rooms and no other person is in possession of the said property except Petitioner 1. This part of the statement of the respondent has not been challenged by Petitioner 1 at all during cross-examination of the respondent, for reasons best known to Petitioner 1. This clearly shows that Petitioner 1 admits the aforesaid testimony of the respondent. (iv) The present petition has been filed by the petitioners for alleged bona fide requirement of Petitioner 1 only. The discussion above, makes crystal clear that Petitioner 1 has concealed the material fact that his son named Atul owns a flat at Pooja Apartments, Patparganj, New Delhi in pleadings. Petitioner 1 has also sought eviction of the respondent tenant for residential requirements of his said son Atul and his family members. In my considered opinion, Petitioner 1 is guilty of concealment of residential accommodation owned by his son at Pooja Apartments, Patparganj, Delhi. It is well-settled law that a person concealing the material fact cannot seek the assistance of the Court. Further, as already discussed above, Petitioner 1 is in possession of 35 rooms which accommodation is more than sufficient to Petitioner 1." 7. There are thus, admittedly 13 rooms in possession of the landlord, though we do not have the user of the rooms. Significantly RW 1 Jagdish Pershad has deposed before the Rent Controller that there are in fact 35 rooms which are all in the possession of Petitioner 1. This aspect of the matter has not been dealt with in cross-examination of RW 1. There is not even a suggestion that the evidence being tendered is an exaggerated version or there is any dispute. In any event, the site plan was also not taken recourse to during the course of hearing before the learned Rent Controller. 8. In that view of the matter we are unable to record our concurrence with the submissions made in support of the appeal. The appeal, therefore, fails and is dismissed accordingly. No order as to costs.